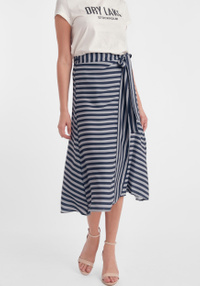 Relaxed style with wide semi length sleeves and an adjustable waist tie band. Wear it for a special occasion or every day. It has a round neckline and is of short length. See also Genesis Blouse with the same print color. The material is composed by 55% cotton and 45% polyester and can handle machine wash. 100% polyester body lining. True to size.